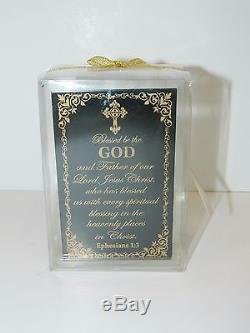 Features a glass panel with an inspirational Bible verse attached to a glass tealight candleholder. 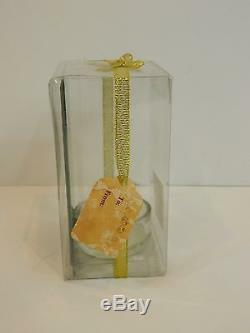 Adorned with a gold ribbon and attached to/from gift tag. 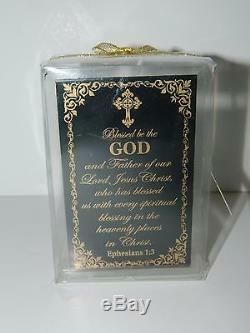 Bible verse Ephesians 1:3. The item "Religious Votive Candle Holder Bible Verse Glass Tealight Candleholder" is in sale since Wednesday, June 15, 2016. This item is in the category "Home & Garden\Home Décor\Candle Holders & Accessories". The seller is "allhappy" and is located in Peoria, Arizona. This item can be shipped to United States, to Canada, to United Kingdom, DK, RO, SK, BG, CZ, FI, HU, LV, LT, MT, EE, to Australia, GR, PT, CY, SI, to Japan, to China, SE, KR, ID, to Taiwan, ZA, TH, to Belgium, to France, to Hong Kong, to Ireland, to Netherlands, PL, to Spain, to Italy, to Germany, to Austria, RU, IL, to Mexico, to New Zealand, SG, to Switzerland, NO, SA, UA, AE, QA, KW, BH, HR, MY, BR, CL, CO, CR, PA, TT, GT, HN, JM.